How very apt that the word finished is perfectus in Latin (at least, it is according to the Internet). Because my earflap hat is perfect! I really can’t tell you just how much work went into the earflaps, but I will say there is earflap detritus all over my couch. I think I knit three or four different ones before the right flap came into being. Pattern: To come! I will be writing it up in full soon. Nitpicky notes: As I alluded to above, I was persnickety about the flaps. The eventual winners were knit using the double knitting technique so that they would lay perfectly flat and also be toasty-warm. Earlier I mentioned my attention to the brim, which I worked with the yarn held double, for thickness and warmth. I chose the stitch pattern out of Barbara Walker’s first treasury; it is based on garter stitch so it creates a dense fabric (also good for warmth!). I very deliberately decreased by a multiple of seven. I decided that an odd number would be the most aesthetically pleasing, and I was convinced 7 was the perfect balance. I think I made the right decision on that. The last step was the pompoms–which I put more thought into than you might have suspected. 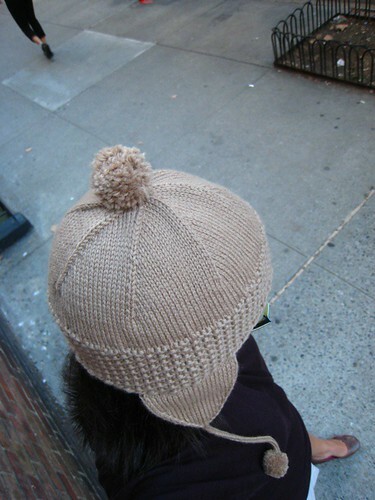 (Sizing was the issue–I know I like dense pompoms.) I hope Liz likes the hat! I can’t wait for the weather to turn so she can start wearing it. In the meantime, I’m making one for me. 58 Responses to hat est perfectus! Lurve it. Excessively. I’d wear it even though it was frickin’ 90 again today. est perfectus!! I can’t believe you’re giving it away — you’re knitting another for yourself, yes? And I am SO making one, the instant you share the pattern. I love the earflap hat — it looks awesome! Great job! I’m looking forward to your pattern. Thanks in advance for sharing! Can’t wait for the pattern! I don’t usually like ear flap hats, but this is adorable! Great job! Good thinking with the double knit flaps! I *love* the hat. I can’t wait until you write up the pattern. I am going to make a ton of them!! The hat is perfect indeed! I don’t even like pompoms, and I’d totally wear it. Your hard work definitely paid off, it’s perfect! it EST perfectus :) She will love it!! I love it – it looks like an acorn – totally adorable. All your hard work paid off. I hope that you do share the pattern, I’ll absolutely knit it! that is stinkin’ adorable!!!!! perfect is right!!! can’t wait for the pattern. I can see a few stash balls of yarn being used up for this! Holy crap, that is the best hat evah. Want one! Want onesssssssss! It’s way cute, but somehow still totally chic! Absolutely adorable! I can’t wait for the pattern!! 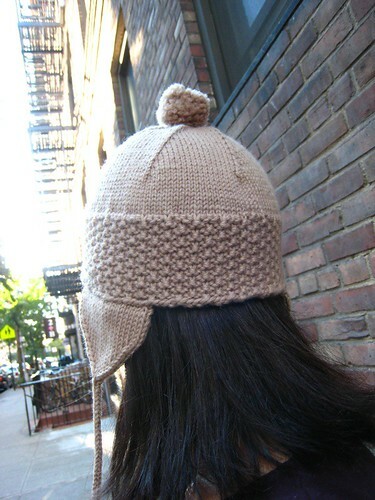 I’m not crazy about pompoms or earflaps, but this hat is amazing! Quite an accomplishment to make me excited over both. I’d love to try this one. Please tell me you’ll share the pattern – I’ve been meaning to figure out a hat like that for myself for ages… but yours looks perfect! You are not wrong that the hat is perfect! Patience with the flappage was so worthwhile. Charming! An earflap hat is a challenging thing to get just right. I’m not an earflap person myself, but it might be just the thing to keep my daughter’s ears warm later this winter. I’ll be watching for the pattern. Thanks for all the thought you’ve put into this design to share with us. Lovely–much nicer than the Internet patterns I found. It’s a good thing I don’t wear hats, or else I’d leap right through the inter-tubes and steal this one from you. I love it! I have never felt compelled to wear a hat with earflaps; but now, I so have to have one! It looks great, by the way! Ah…MUCH less helmet-like. Very nice indeed, and sure to be added to my Ravelry queue in anticipation of the icy Washington winters. Well done! The ear flaps are perfect, and I really like the pattern stitch. Glad you are writing a pattern! great hat – glad to see it worked out so well! Fantastic – glad you got it all worked out in the end. Love the decrease! That came out so well! You did a wonderful job. I love it! I am thinking a 2 year old- sized version for our camping trip next year. It’s adorable! Your hat is perfectus! Seven was definitely the right choice for decreases. Yet one more thing to put in my projects queue. I would certainly say that came out ad libitur (as desired)! Ear flaps are hard, it took a lot of fiddling when I made a hat for my daughter last year. Love you hat! I can’t wait for you to publish the pattern. oooh, so perfect! i want to make one too! That is awesome! I so want for you to publish that pattern! Pretty please!? Okay, so I’m last to the “I love it!” party on the blog, but I was totally in attendance at the “I love it!” party in person last night. I really really want to make this hat. I love me a bandwagon. that’s an awesome looking hat. and i may have to make one just to see if i can get away with an ear flap hat. because i really want one but every earflap hat i’ve tried looks stupid on me. or rather i look stupid with it on. oh when you write up the pattern, can you tell us what size noggin it fits? So cute! I look like a huge dork in hats, but maybe some kicky earflaps will help me out? Looking forward to your pattern! Oh, yay! What a lot of trial and error, but what a fantastic end result. i’m sure your friend will love the hat, and I hope to have an opportunity to use your pattern sometime soon. Thanks for sharing! LOVE your hat pattern, wondering when you will put the pattern up?? My little sister is desperate for one like it! I would like to have this pattern. It could be knitted on smaller needles for my grandchildren. 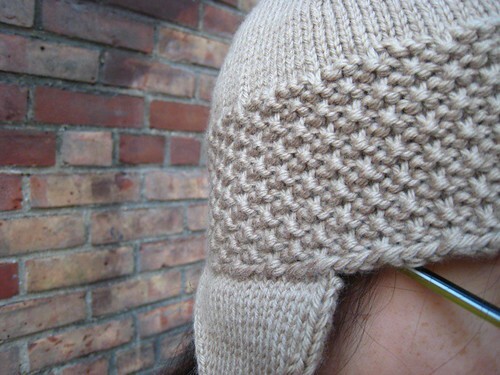 hi, i’m a newbie in this knit world and am currently trying to make this hat. what i don’t understand is: what’s the meaning of “swap the next 2 stitches on the needles”? so cute! lovely greetings form Berlin (Germany)! Any chance you’ve got the pattern written up for this? I’d love to give it a try!